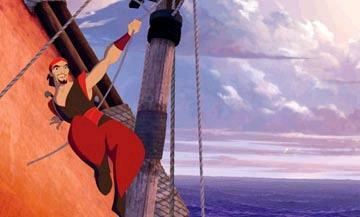 Sinbad gets a new treatment in Sinbad: Legend of the Seven Seas, the latest animated feature film from Dreamworks. They've stopped trying to wrest the animation crown from Disney, which is just as well, because Sinbad is merely good to middling. The Book of Peace, a magical object that ensures the safety of the Twelve Cities, is missing, and everybody believes Sinbad (voiced by Brad Pitt, Confessions of a Dangerous Mind, Full Frontal) stole it. Everybody except for Sinbad's childhood friend Proteus (voiced by Joseph Feinnes, Dust, Enemy at the Gates). Sinbad is scheduled to be executed in ten days, but Proteus, heir to the throne of Syracuse, convinces the authorities that he will stand in Sinbad's place, and that Sinbad will go in search of the Book of Peace. If he fails to return, Proteus will die. This presents a moral dilemma for Sinbad, up to this point a happy-go-lucky criminal, robbing his way across the ocean with the ultimate goal of retiring in Fiji. He doesn't care that Proteus will die, he's just glad to be free. Or is he? John Logan (Star Trek: Nemesis, The Time Machine) wrote the script, and he infuses a sense of swashbuckling adventure missing from most pirate movies with a more personal purpose for the Sinbad character, but while the set-up sounds good, the execution of the idea makes the film less than appealing. The largest deterrent is Pitt, who does provide star power to the movie, but sounds bored most of the time. He has a habit of speaking so low he sounds like mumbling, which drains energy from the story. To ensure that Sinbad doesn't run away, Proteus' fiancee Marina (voiced by Catherine Zeta-Jones, Chicago, America's Sweethearts) stows away. All her life, she's longed for adventure on the high seas, but was never able to go. She instantly dislikes Sinbad, but begins to sense their common thirst for thrills. Zeta-Jones is nice in the role, but Logan never explains her sudden transformation from nobility to experienced sailor. Sinbad and crew are racing to the supernatural realm of Eris (voiced by Michelle Pfeiffer, White Oleander, I Am Sam), Goddess of Discord. She has so much power that it's not even funny, yet Sinbad will still manage to win (hey, not like it's a secret how the film will end). For somebody who can turn to mist, conjure up storms and other supernatural disasters, it seems odd that she doesn't just crush Sinbad's ship. 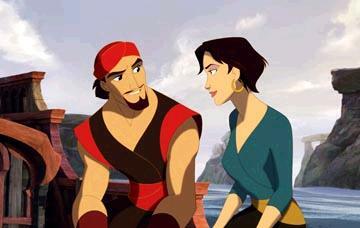 Sinbad is a nice mix of traditional and computer animation. While it does not do anything groundbreaking, it does combine the two better than some other movies (Pokemon Heroes for instance). Directors Patrick Gilmore and Tim Johnson (Antz) do some nice work with light and shadows early on Sinbad's ship when one of the characters is jumping around lighting lanterns. The characters look a little too much like the ones from The Road to El Dorado, and unfortunately none are too memorable. Hey, at least there aren't any songs. All the elements of Sinbad fail to gel together to form a cohesive whole. Taken piece by piece, parts of the film are nice, but together it is only so-so. 1 hour, 25 minutes, Rated PG for adventure action, some mild sensuality and brief language.